Kyuuemon brings to life Ninja Kuroari to make use of his unique ability. Meanwhile, Takaharu is out for a run when the young lady from last episode pops up and attacks. They spar for a second before she poofs away. Takaharu calls for her. Kikyo is her name. It’s apparently been a long time since they’ve seen each other and are actually good friends. He brings her back to the dojomanse and tells her about Grandpa actually being alive. The cousins are peeping through the wall wondering about whether she is Takaharu’s girlfriend. Yakumo thinks she’s pretty. But they all agree they can’t let Fuuka know otherwise she’ll really give her the once over. But Fuuka sees them and they all come bursting out of the wall. Takaharu explains that he stayed at Kikyo’s dojo while he was on his training travels. Kikyo was his training partner. Fuuka asks what she is doing here and Kikyo tells them that her old master Ryuji Ise Kiroku has opened a new Ninja School and asked her to be a teacher. Takaharu joins Kikyo to help out with one of the classes. The kids think he’s just a weird creeper at first, but are soon amazed by his skills when he easily takes care of the obstacle course. 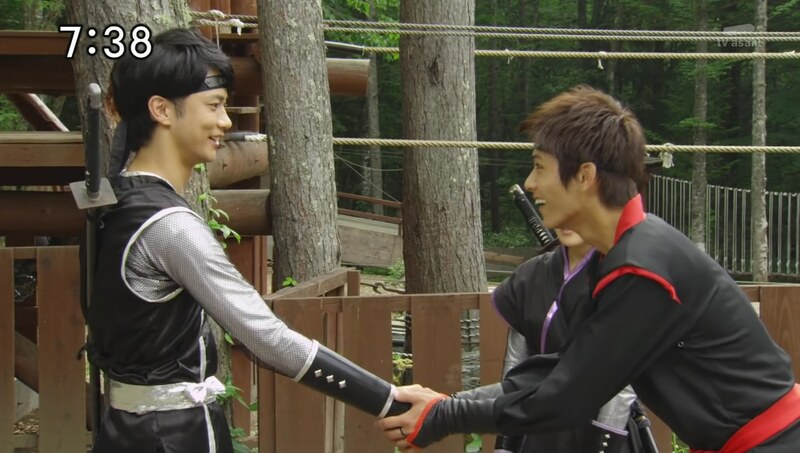 Kiroku arrives and he and Takaharu introduce themselves. Takaharu thinks Kiroku is cool. But later, he notices the kids aren’t all that fired up for ninja stuff. Kikyo takes that as an insult and tells him to just leave if he’s here to nitpick. Meanwhile, Kasumi, Yakumo and Kinji are checking out the school, suspicious it might be Kyuuemon’s doing again. But so far, everything seems clean. Kiyoku, however, listens to their entire conversation. He heads into a nearby cave and enters a secret passage to an underground waterfall. Here he meets Kyuuemon and tells him that it was a mistake to pick-up Kikyo as she’s related to the Igasakis. It will be difficult to train the kids to become part of the Kibaoni Army. But Masakage says this is a good opportunity to combine Ninjutsu and Youjutsu to take advantage of Kikyo’s feelings. Kasumi, Yakumo and Kinji go to follow Kiroku, but Masakage meets them. They henge and fight. 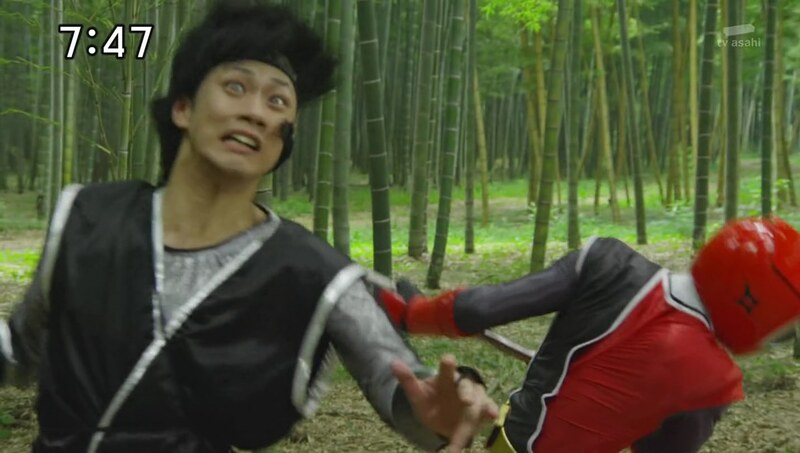 But Masakage retreats when Kinji goes after Kiroku. Turns out, this is part of the plan. 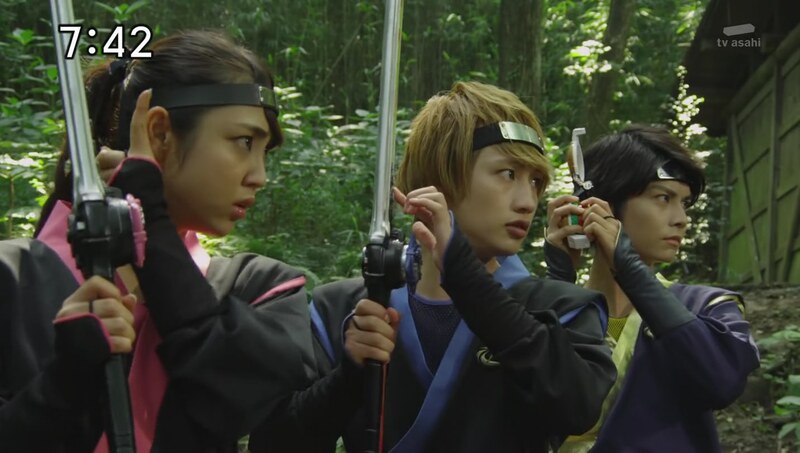 Takaharu returns to the dojomanse and the others fill him in on what’s going on. They tell Takaharu that he needs to let Kikyo know about Kiroku’s true allegiance without causing a stir. Takharu talks to Kikyo, but she doesn’t want to hear it. Kiroku approaches and Takaharu henges. He demands Kiroku show his true identity, but Kikyo tries to stop him. Kiroku tells Kikyo to hold Takaharu steady. As Kiroku approaches with his sword, Kikyo remembers Takaharu telling her earlier that he’d never lie to her. Realizing Takaharu is telling the truth, she lets him go. Turns out Kuroari had been using Parasite technique to posses Kiroku. 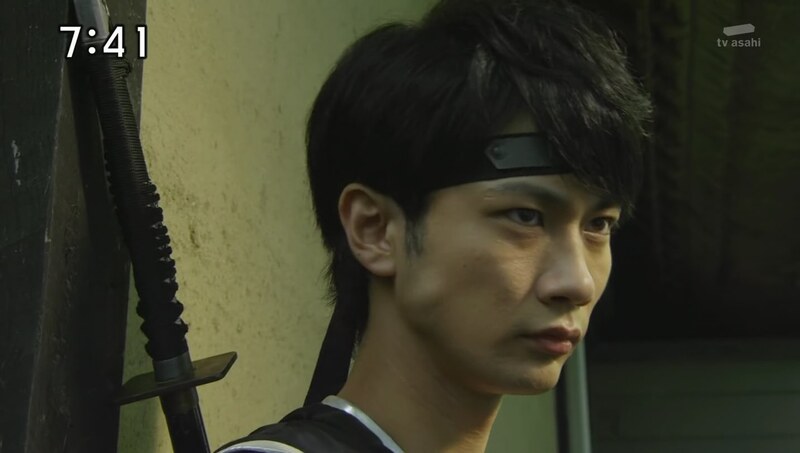 Kuroari readies an attack to kill Kiroku for good, but Takaharu blocks the attack and is forced to dehenge. The other Ninningers arrive and say the kids have been safely evacuated thanks to Takaharu drawing the Kuroari’s attention here. As Kikyo takes Kiroku to safety, Takaharu rehenges. The Ninningers and Kikyo fight off Supparage. 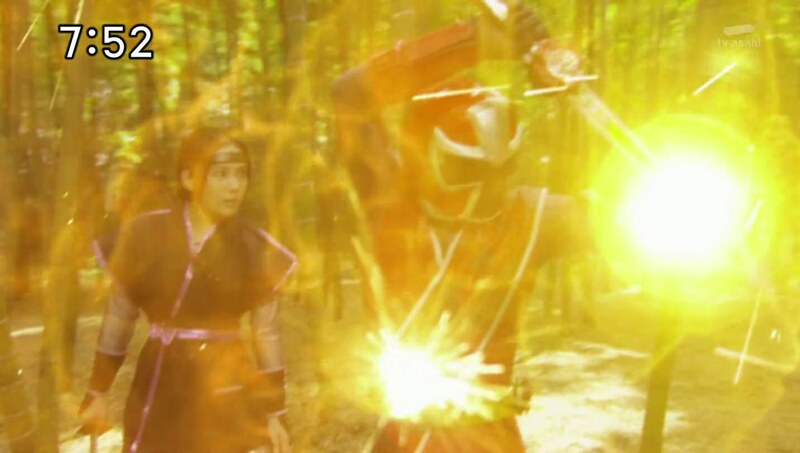 Takaharu and Kikyo decide to team up like they’ve done before to fight off Kuroari. Takaharu goes Chozetsu to finish off Kuroari’s first life. Kyuuemon embiggens Kuroari and the Ninningers hop into Lion Ha-Oh and King ShurikenJin. Kuroari puts quicksand under the robos, but they still manage to fly out of it. They deliver final strikes and finish off Kuroari for good. Masakage tells Kyuuemon that he’s failed again. But he says Kuroari did his part. 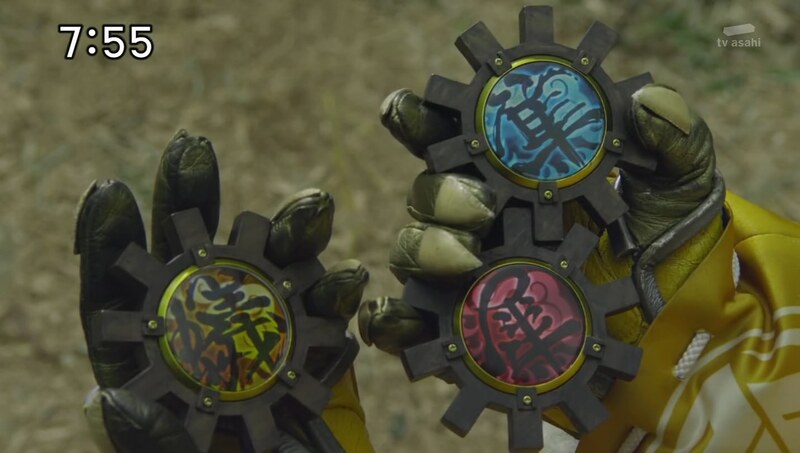 Kyuuemon takes out three core medals shuriken: Falcon, Rhino and Ant. Back at the Ninja School, Kiroku apologizes for the trouble he’s caused. But Takaharu says it wasn’t their fault. Kikyo starts to ask Takaharu something about the next time they meet, but instead just asks when that next time could be. Takaharu says it’ll be when he becomes Last Ninja. They shake on it. The cousins tease an oblivious Takaharu about his not-girlfriend. Ryuji?! What are you doing here?! Hehe. It was great see Ryoma Baba again, even if it’s a brand new character. (I miss Go-Busters!) Being a ninja definitely suits him. Takaharu and Kikyo were cute. Since the team this year is all family, I guess a little romance angle like this is alright. I forgot Takaharu had been wandering about before the season began and he arrived home. I hope they focus on those travels maybe in one or two more episodes. Focus on people he’s met along the way. Kyuuemon continues whatever plan he’s got. But this episode was more about Takaharu and Kikyo’s relationship and the MOTW. And in that sense, it was a pretty good episode that I fully enjoyed. Some nice fun sprinkled throughout. ← Recap: The Amazing Race Canada 3, Episode 12 and Season Wrap-up – "You don't need to travel somewhere else!"